Sorry ladies... I meant to post a basic tutorial on these for you... Not a lot to it though. First, sand your box if it is a little rough, and then paint the insides of it, and then the outside edges...Be sure to paint inside the edges of the opening at the top where the tissues pop out !. Otherwise it will look kind of "unfinished" . Then, use good quality cardstock to cover the outside of it. Measure the sides of your box and using a straight edge, cut the cardstock into 4 panels that are about 1/4" more narrow and 1/4" less in height than the wood box. You want a little of the painted edges to show through. Measure the top of the box and cut the paper again about 1/4" smaller. Tape the paper to the top with some temporary tape... Then, turn your box over and trace the hole with a pencil onto the backside of the cardstock. Take off the tape, then cut out the hole where it has been traced. THen glue it to the top of the box . At this point, You may begin to add any other paper layers or decoupage pieces to the cardstock on the outside of the box that you wish. 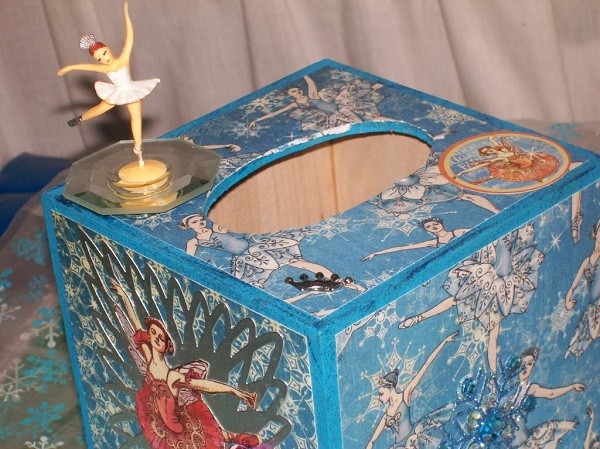 Then, you should MOD PODGE or lacquer coat the outside of the box. Then, start adding embellishments to your hearts desire... Ribbons, flowers, beads, metal corners, whatever you wish ! I love adding something really nice to the top that reflects the theme of the box - like a Dancing Ballerina, or a Mini Dog House, or whatever Minis you like. Have fun with these !! You can see from the picture where I made this first box a long time ago and did not paint the inside of the box.... I went back later and painted the inside because I saw my photo and thought it looked terrible ! The ballerina on top was a cake decoration ! !